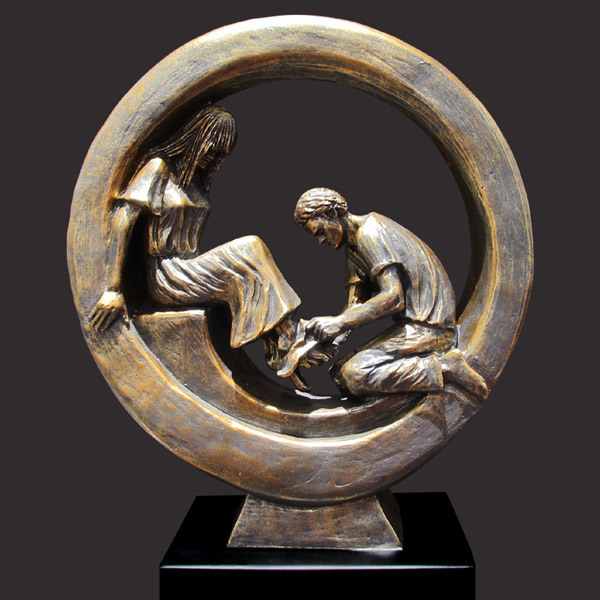 Bride And Groom by Timothy P. Schmalz is an enchanting piece of Christian sculpture that depicts the love a man is biblically commanded to show toward his wife. It is the same selfless love shown by Jesus toward His disciples. It would make a wonderful addition to any home décor setting. The symbolic ring shape envelopes the scene of the husband washing the feet of the wife, just as Jesus washed the feet of Peter. The sculpture is also symbolic of the metaphor of Christ being the bridegroom of the church. Measuring 6.25H x 5.5W x 1.25D & 14H x 10.5W x 4.5D respectively, this solid resin-stone cast is coated in a realistic bronze finish and is mounted on a solid matt black base. 2 sizes available - see drop down box for pricing.